Driving along the west coast of Morocco, we turned inland at Agadir. 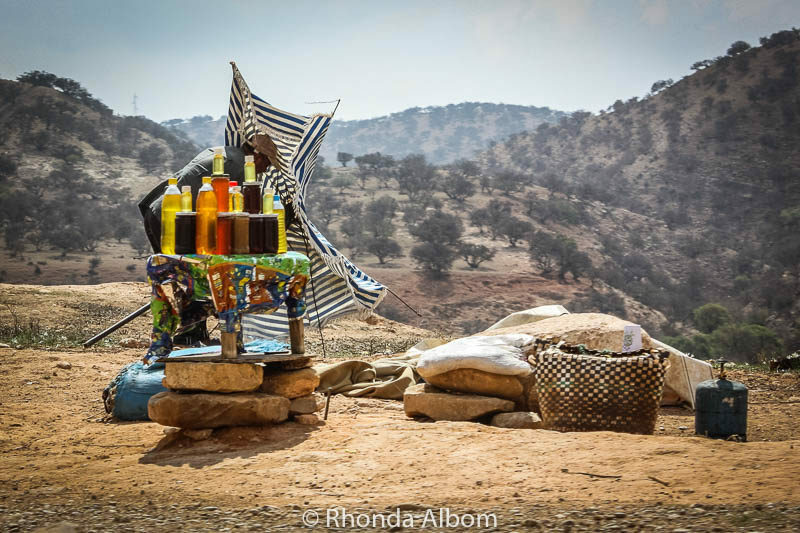 We passed several roadside vendors offering Moroccan argan oil, but we didn’t stop. We were on a mission to find goats in trees. Were the rumours true, where does argan oil come from? Could goats actually be the first step in the making of Moroccan argan oil? Argan oil sold on the side of the road as we drove south of Essaouira in Morocco. 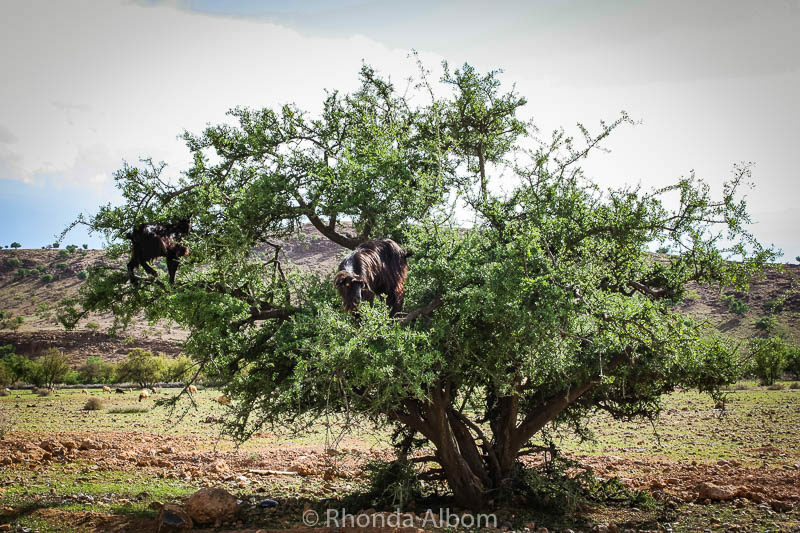 We were told we would see goats in trees between Marrakesh and Essaouira, but we didn’t. Again between Essaouira and Agadir, there were none. 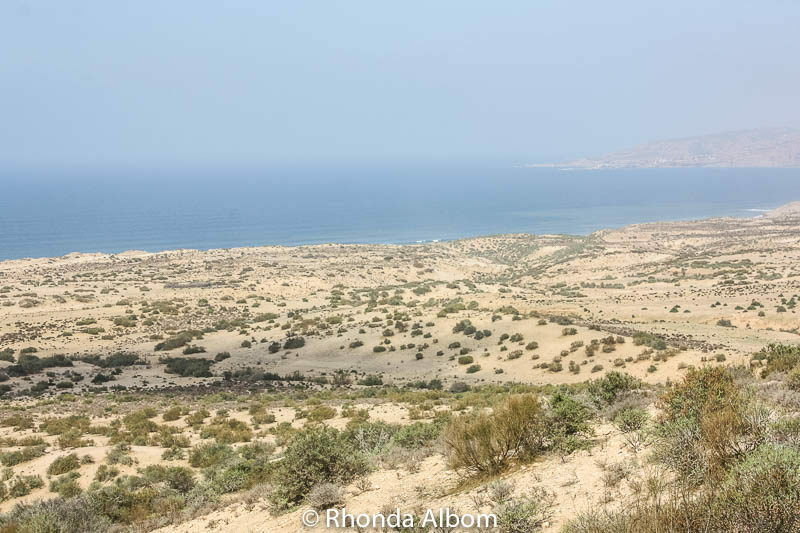 A barren and misty coastline as we drove from Essaouira to Agadir in Morocco. Now we were heading to the interior. At least the driving was easier outside of Marrakesh. There were fewer drivers on the roads cutting us off, donkey carts now stayed on the shoulder, and almost no pedestrians ran randomly in front of the car. The ever-changing views are dotted with litter, and finally, there they were: the goats in trees. 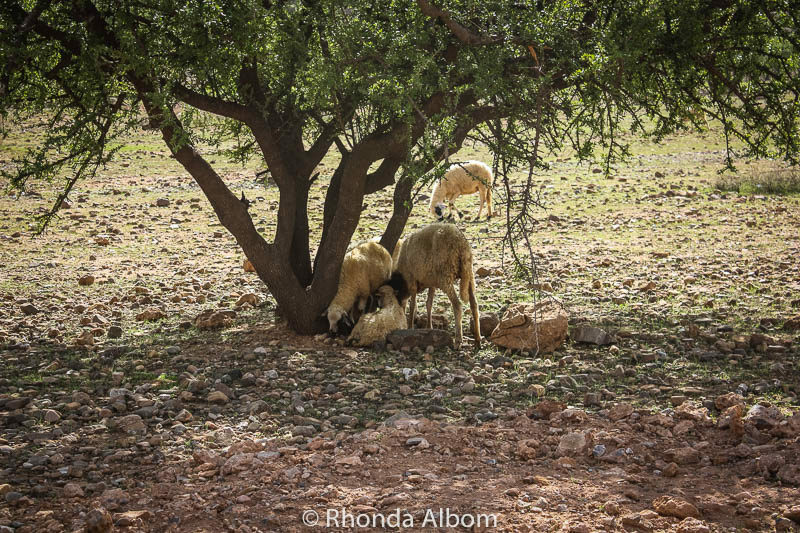 The goats soften the husk and process the argan seed. Moroccan argan oil is made from the seed of the Argania Spinosa (Argan Tree), a native to the Souss-Massa-Drâa region of Morocco and Algeria. 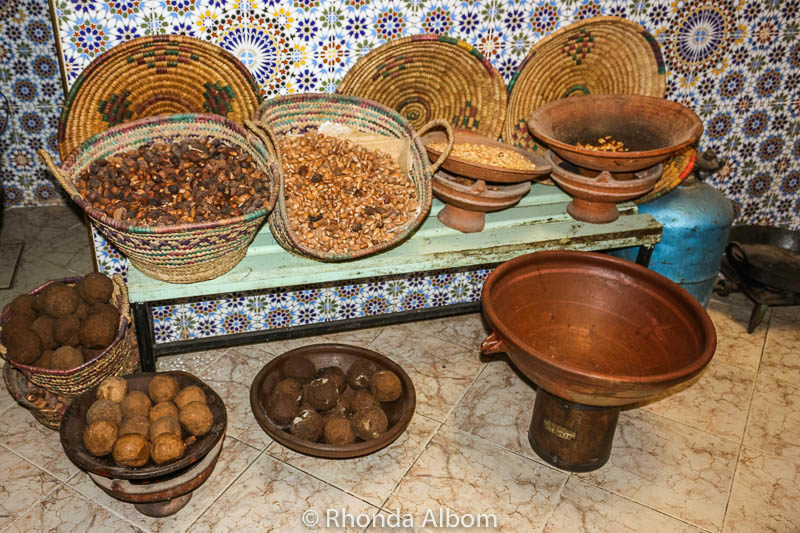 While the traditional method allows the goats to processes the nuts first, as this softens the husk, some Berber women will hand pick and open the nut to get at the seed. The next step in the process is to laboriously hand grind the seeds thus producing the oil. 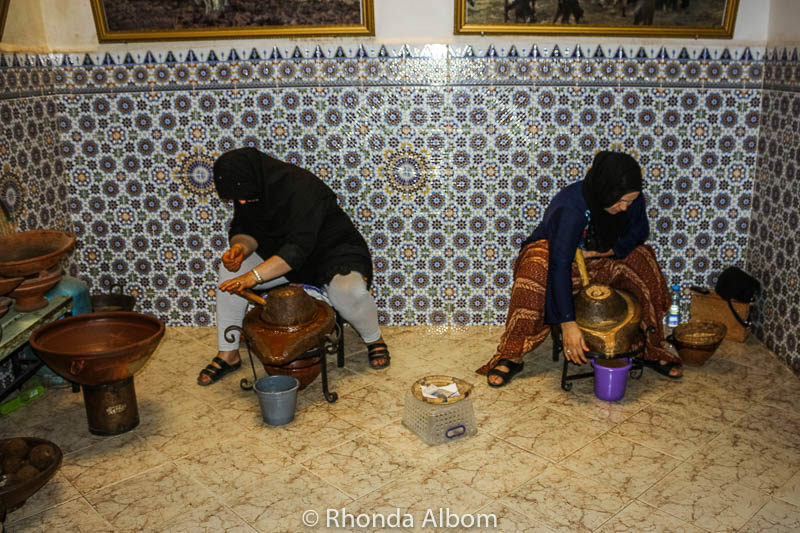 Often a family business, we were lucky to be invited into a home where they process the argan seeds. The two women worked non-stop. While they allowed me to take their photos, they requested that I not include their faces. The argan seeds are in the baskets on the table. Moroccan argan oil is often referred to as a miracle oil or liquid gold. Its benefits to skin and hair are well known. It’s also thought to aid in digestion, reduce joint pain, and stabilize blood sugar. We were able to apply a few drops on our skin, and also offered a small bowl of argan oil and bread for dipping. It’s smooth with a pleasant aroma and an acquired taste. There is usually a goat herder with the animals. Standard practice is to offer a few coins in payment for taking photos. While we wonder if we could have brought fresh Moroccan argan oil back home to New Zealand (as we have strict biosecurity laws), I regret not purchasing more of the oil at the Moroccan prices. Today, Moroccan argan oil seems to be a common ingredient in hair and skin products. While in the region, we treated ourselves to a bit of luxurious relaxation at Riad Jnane Ines in Taroudant. 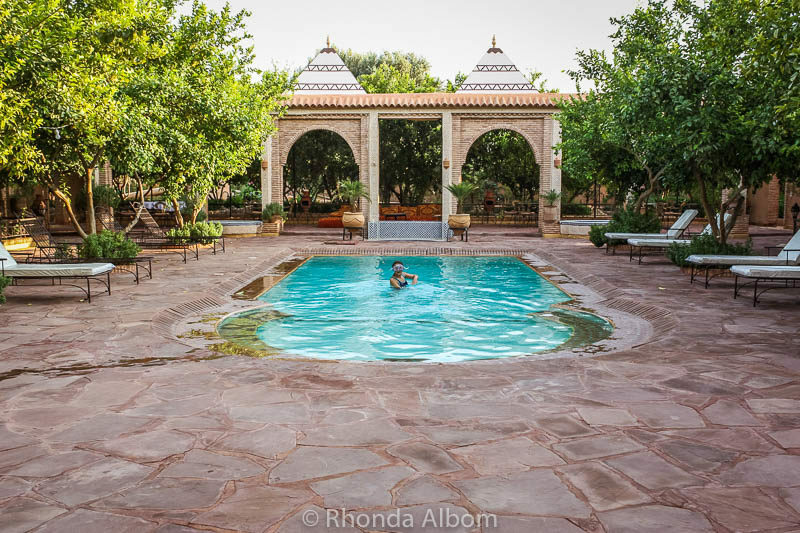 Fragrant lemon trees, a beautifully manicured garden, an outdoor pool, and a wellness centre with a hammam bath made this a day of paradise amidst the hustle of Morocco. 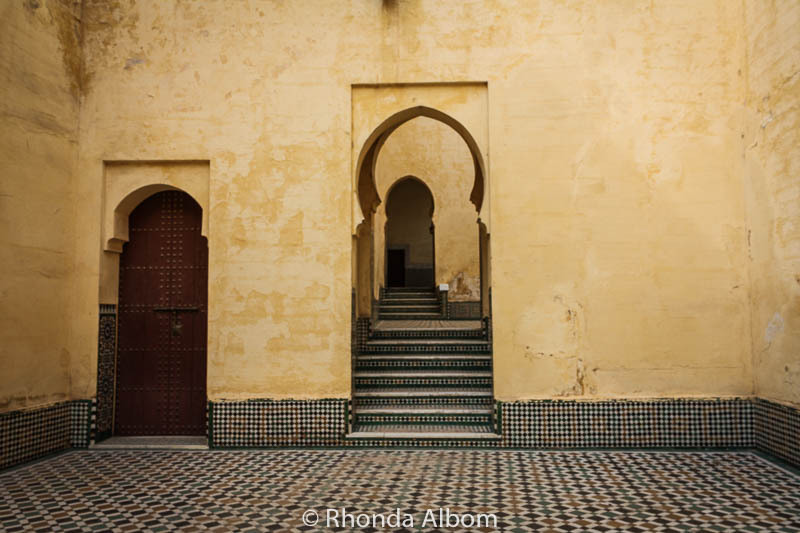 The pool at Riad Jnane Ines was the typical keyhole shape often used for Moroccan doorways. Taroudant is a mix of traditional and modern lifestyles. We ate dinner at the pizza restaurant in the corner after our vegetarian daughter discovered that the adorable rabbits and chickens in the garden were on the dinner menu at the Riad. Our Moroccan Road trip started with train travel from Fes to Marrakesh. 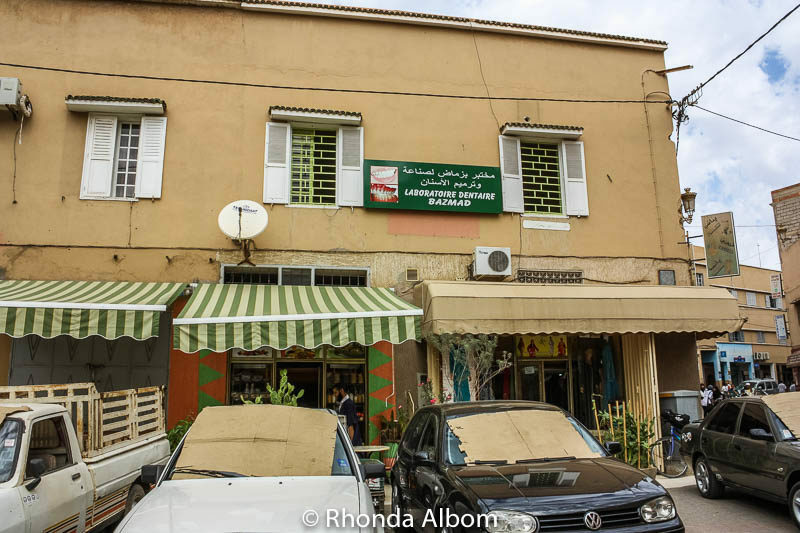 Here we rented a car and headed first to Essaouira on the west coast, then south to Agadir before turning inland and passing through Taroudant on the way to the Sahara. Have you seen goats in trees? Did you know that Moroccan argan oil seeds are first processed through a goat? Ohh, those goats :). Here, in Cyprus, we found them climbing trees too (not sure what’s variety though). It was quite a bizarre sight for an outsider inexperienced in goats’ habits. Do you remember where exactly you spotted the goats? Close to Agadir? I am in Agadir right now and hired a taxi for tomorrow just to see the goats in the trees. I wonder how far it is..? Sorry, not exactly. I know it was closer to Taroudant than to Agadir. I believe it was after the N8 on the stretch along P1714. We also saw them just on the far side of Taroudant on the N10 on the way to Ouarzazate. We had our car, so we just watched for them along the road. There will be a shepherd with them, and they were easy to spot. Your driver should know where the trees grow. So glad you got to see them. Did you get photos? Goats in trees?! So awesome! Love the photos and it sounds like a wonderful experience to be invited into one of the local’s homes to see how it is produced. 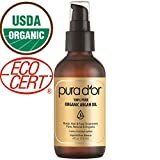 I never realized how Aragon Oil was made, so it’s interesting to learn more about it as I’ve been seeing it in so many different products lately! It was really interesting to find out and see the process. I am just glad I was able to take the photos and share them. We bought a lot of Morrocan oil when we went to Morroco. I love it. It makes my skin so smooth I feel it is really effective. I wish I had bought some when I was there. Oh, Rhonda, those goats in the trees are so cute! You take the best photos ever! Is the Morocco the only country that makes argan oil? I buy some body lotion and shower gel with organ oil but they are made in Italy. After reading your post I began wondering if the Italians get the argan oil from Morocco or they produce their own. Thanks Anda. I know believe the trees also grow in Algeria, but I have no idea if the oil is made there as well, nor if it is made in Italy. That is so interesting! I’ve been to a Kopi Luwak local Balinese facility and personally witnessed the whole process of retrieving the coffee beans from the animal. 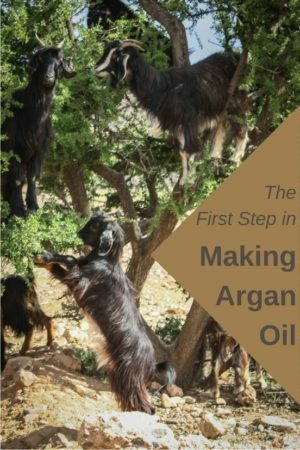 I would never imagine reading about goats doing the same type of process for Argan oil. The whole process? I am not sure I would drink it if I saw the entire process. Goats are so awesome. There is literally nowhere that they won’t climb, is there? I’m seeing argan oil everywhere these days, both in markets and in cosmetics. It’s a good reminder to see how labor intensive it is – I’m guessing there’s very little genuine product in a lot of the lotions I see. I would imagine the cheaper commercial product don’t have either real argan oil, or not much if they do have any. I’ve seen goats and I’ve seen trees, but I’ve never seen goats in trees! So it is true! LOL. Yes, I don’t think too many people have seen the goats in trees. It’s pretty impressive to watch them. As for the seeds, if you are not paying too much for your argan oil, it might be factory processes. Personally, I prefer the traditional product. I’ve seen Argan oil mixtures on shelves in California but had no idea of its benefits and process. Love that you were determined to find the goats doing their business. Enlightening! Honestly, I didn’t realize just how popular it had become until I returned home and suddenly saw argan oil everywhere. What a beautiful part of Morocco! I never saw any goats in trees there, but I did see them in the desert in India. Fascinating that the women grind the seeds by hand — that must be so labor intensive. It looked like so much work when I was watching them. I regret not asking if I could give it a try just to see what was involved. Nice little story! If not for this I would never have known about this quirky little piece of artistry. Would love to buy some in Casablance whenever I do eventually get there! And ya goats in trees, reminds me of my childhood home in rural India! Nice to know someone else has seen goats in trees outside of Morocco. 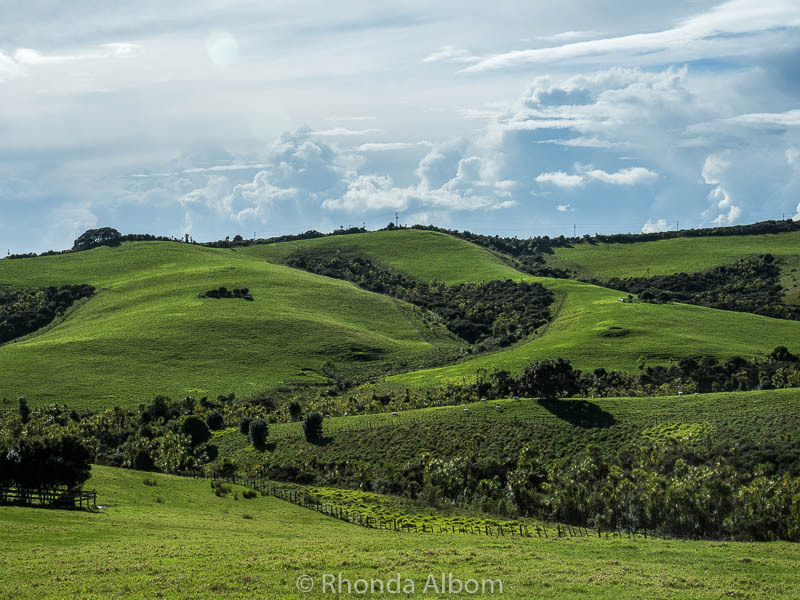 Hi Rhonda, I think blogger ate my comment. 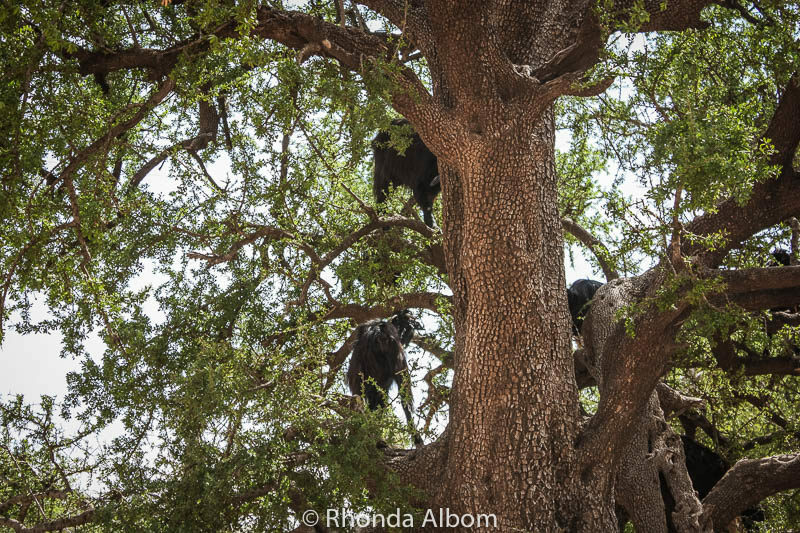 Fascinating photos of goats in trees! Interesting facts about Argan oil, and I will think twice before putting it in my hair again! Blogger does that. It was fascinating to see the goats. And don’t worry, the “processed” seeds are well cleaned before they reach your face. Now, being a farm kid growing up, it was not unusual to see all sorts of farm animals in all sorts of environments, but I’ve never seen goats in trees! Come to think about it, Argan Oil does feature in some hair products but I never knew the process it goes through. Really enjoyed this post, thanks. I had heard about the goats in trees but really had to see it with my own eyes. I’m not sure if most people want to know the processing behind the ingredients in their hair products. I’ve never seen goats in trees but I’ve seen goats in the Swiss Alps and wondered how the heck they managed to climb certain mountains, so I’m not totally surprised about goats in trees in Morocco. However, your pics are nevertheless amazing. If someone had just told me, I might have believed he was making fun of me. I thought it would not be a common sight but we were just driving along and there they were. Goats must have an incredible sense of balance. It is pretty unusual. Amazing what animals can do. That’s just plain interesting. I had no idea. And coincidentally, I just bought my first bottle of “argan oil” shampoo the other day. It may be the latest craze but it has been produced and used in Morocco since ancient times. I didn’t know goats played a role in the processing of Argan oil. I enjoyed your photos and narrative. Wow, I had no idea how much work goes into this process! It is a long process but it is typically done by women and as I was told, it is one of the few ways these women have to make money. They are real. I didn’t believe until I saw it with my own eyes. That is so awesome! My family was just discussing the kopi luwak coffee process earlier this week. It was something my hubby brought up while we were driving and my kids couldn’t believe it! These photos are just gorgeous! My kids didn’t believe it either. Then they saw the goats in the trees. Wow! Who knew! When I saw the title of your post I didn’t expect it to be literal! I never thought I’d see that! Goats in trees! But I always love to hear how the products we use on a daily basis come to be. This is very interesting. Thanks! I was amazed as well. We were just driving along and there they were in the tree. And, who would have ever thought to grind up the spent seeds and eat the product or use it on their body? That first goat in the photo looked a little indignant with you taking it’s photo. What a process for making oil. Poor women having to do all the hard work again. Must remember to not have any of the Coffee you mentioned. Actually, I’ve had the coffee and it was rather good. Thanks Lisa. It was pretty cool to be there. Poop is used for so much, it fertilizes just about everything we eat – or if we are eating animals, it fertilizes what they eat. In this case, the poop is removed. It really is. I loved being in Morocco and learning about cool things like this. 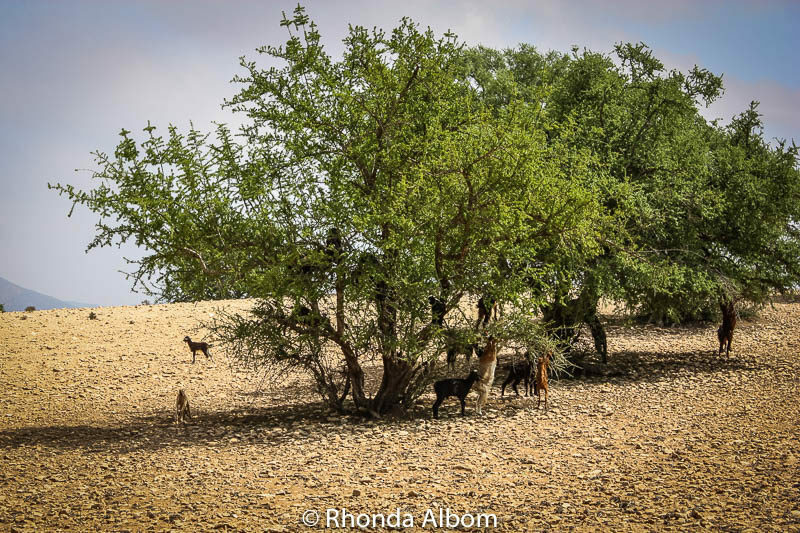 Great to see how the goats help the argan oil process! 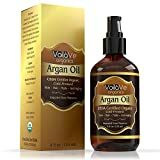 I love argan oil on my face and hair, but haven’t tried eating it. I think it is processed differently for digestion, but I am not sure. Very interesting. Thanks for teaching me about the oil. Love the goats in the trees. Very cool. Next time you are in the shampoo oil, take a look at the products at the more expensive end. Many will have argan oil. I’m pretty sure I’ve heard of goats climbing trees with low branches, but have never seen them myself. What fun that would be! Yes, it was so cool to see this live. Love the goats in the trees. Too cute. Don’t know anything about the oil. I loved your comment about acquired taste. That means I wouldn’t like it. No, you probably wouldn’t like it the first time you tried it. I didn’t have enough to know how long it takes to acquire a taste for it. I knew goats liked to climb but did not know they could get in trees. That’s a first for me! Thanks for sharing! Until I saw it for myself, I had no idea goats could really climb trees. I take it the seeds those women were processing were not from goat poop? 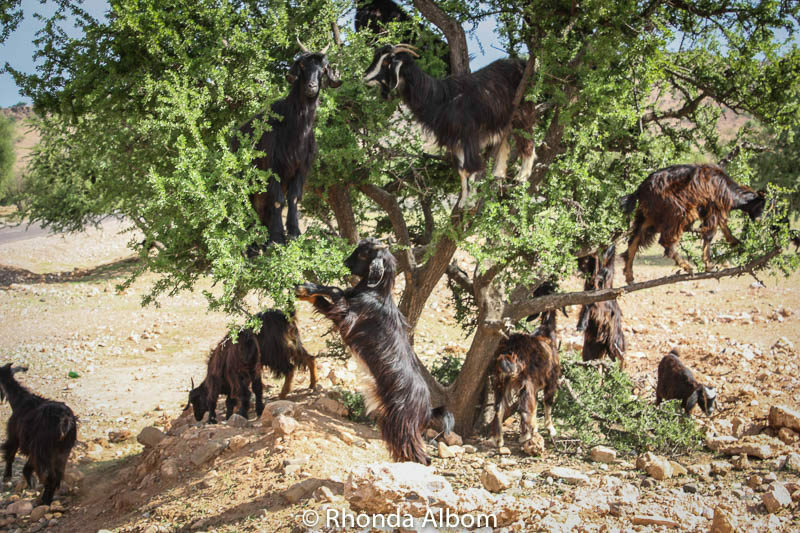 I’d seen photos of the goats in trees before but didn’t know the full story of why or about the oil. They could be, but they are well cleaned before the ladies get them. How I miss traveling to that side of the world! Morocco is always mesmerizing..love to see those goats up there! Me too. I would love to go back to Morocco. Goats in trees! Amazing shots. On the other hand, I prefer not to put goat poop leavings on my face and hair! YIKES! The seeds are well cleaned. If you think about it for too long, there wouldn’t be much to eat. Afterall, it’s poop that makes up most of the fertilizer that grows our veggies. I enjoyed the post and pics quite interesting and seeing the goats in the tree heheh! I thought so too, when I saw them live. Loving those goats, good to see they have plenty to eat. Goats will eat just about anything, so even if they run out of argan nuts, they won’t go hungry. You weren’t offered goat for dinner? LOL – The goats are in the trees outside of the town. The riad only had bunnies and chickens – and they really would have slaughtered one for us if we wanted it for dinner. Interesting story and photographs! The goats eat the pulp of Argan fruit and spit the seeds. The spat seeds are collected to extract oil. The poop story has been created to make it sound exotic. According to what we were told when we were there, and what my research says, that is only partially true. Sometimes they spit it out, but usually, they process it through their digestive tract. Really, if you think about it, it would be more unusual for a goat, an animal known to eat just about anything, to spit than to swallow. I’ve never seen a goat in a tree… nor would I want to pick my dinner from a pen in the yard.